If you were to ask your Dartmouth emergency vet about the most important things that you can invest in for your dog’s health and welfare, they would likely tell you that proper veterinary care with regular check-ups and basic obedience top the list. Your dog doesn’t have to be so well-trained that he could win a championship, but he should be trained enough that he will come to you whenever you call him. Many of the cases that involve dogs being hit by a car could have been avoided with a little bit of time spent in training. Dogs scared of loud noises can bolt into the street. Fourth of July fireworks, back-firing cars or even kids playing in the neighborhood can be a real problem, especially if there are any anxiety issues in dogs. It is amazing how all of that training can come back in an urgent situation, and how it has the potential to save your dog from great injury or even death. Beyond training, vaccinations and preventive treatments, are the best way to keep your dog safe and healthy for many years to come. The best way to be successful in training is to learn more about your dog. Dogs give us clues as to how they are feeling. You can tell if they are happy, sad or upset about something, but you can also tell if they are uncomfortable in a situation. 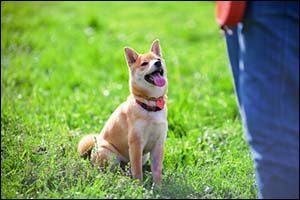 Certain dogs, locations and activities can make them upset. Dogs scared of loud noises can be comforted by their owners before they get to the point of bolting or completely losing control. Training can be a big help in this area for a number of different anxiety issues in dogs. Dogs are not one-size-fits-all creatures. Just because something works for one dog, does not mean it will work for all dogs. Be affectionate with your dog to let them know that you are happy with their positive behavior, just as you are ready to show them when you are unhappy with their negative behavior. During training, it is more likely that extra attention and praise will reinforce good habits than treats. While treats are appreciated, your dog is most excited when he knows that you are happy with him. Regular veterinary care in Massachusetts can help you stay on top of any small problems before they develop into big issues, as well as prevent a lot of common problems from occurring in the first place. The same holds true with your training techniques. Clearly state what you want your dog to do – don’t just say “yes” or “no” with regard to behavior. Simple commands that express your intent will work better, such as “sit” or “down” when you want him to stop doing something or pay attention. This must be consistent throughout your training, not just with you and your dog, but with other people in your household. A spouse, a partner, a roommate, a child – everyone needs to be on board with the commands. Training a dog to sit when new people come in the room means that the dog needs to receive the same command from each person in the household. You can’t have some saying “off” while everyone else is saying “down” or “sit”, because the dog will become confused. Make sure that everyone is on the same page and participating together for best results. If you have a dog that is wild and unruly, don’t expect that he will be a perfect little prince after just a week or two of training. It can take a while to change bad behaviors, so it is important to just stick with it, while being consistent and patient with your dog. Sometimes the most difficult types of training can be skills that work opposite of their natural dog instincts, such as barking or bolting, especially for a dog scared of loud noises or situations. Jumping, digging and running away can be difficult and, unfortunately, are often direct causes of pets that come in for treatment at our Dartmouth emergency vet. The more you can do on a daily basis to provide training to overcome anxiety issues in dogs, as well as other bad habits learned by former owners or just through bad training habits on your part, the easier it will become to keep your pet under control and safe in all situations. Some people think that if they just keep their dog in the backyard that they won’t have issues. The truth is that whether you walk your dog on a leash in the neighborhood, take your dog on trips or keep them indoors for 80 percent of the time, accidents can still happen. They can still bolt out the front door, pull off a leash, jump over a fence, dig under a dog run and be gone, out into traffic, or get lost. It only takes a moment. Contact Anchor Animal Hospital for quality veterinary care in Massachusetts by calling 508-996-3731 to schedule an appointment with our team or to learn more about our wide range of veterinary services.